September real consumption increased for durable goods at a rate of 1.8 percent, the highest rate of growth since March, and for nondurable goods at 0.2 percent. Consumption of services, however, was flat, largely due to a 1.8 percent decline in food services consumption following big gains in prior months. Other discretionary categories of spending were mixed: recreational goods and vehicles rose at a rate of 2 percent from the prior month; recreational services declined by 0.1 percent; motor vehicle and parts increased by 3.1 percent; personal care services increased by 0.1 percent; clothing and footwear declined by 0.6percent; and spending on personal care products remained the same from August. A number of factors explain the robust consumption growth, including high consumer confidence in the third quarter of 2018, record-setting net worth figures, and the near 50-year low in the unemployment rate. We expect consumption growth to moderate in the first half of 2019 as the boost from the tax cuts fades. 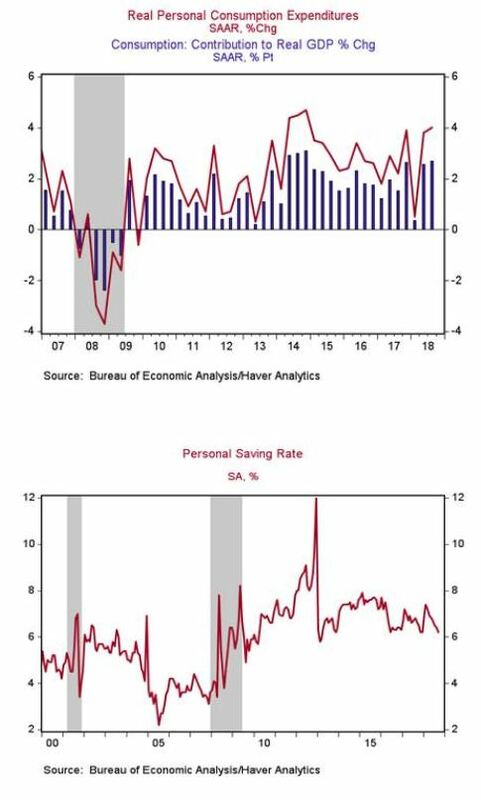 But in the near term, favorable fundamentals, including strong gains in employment and modest increases in wages, have lifted disposable incomes and are likely to translate into another strong holiday shopping season. As for inflation, even though it has been rising at a 2 percent rate in the last year, that rate has clearly moderated in recent months and signs of any imminent acceleration are not apparent. 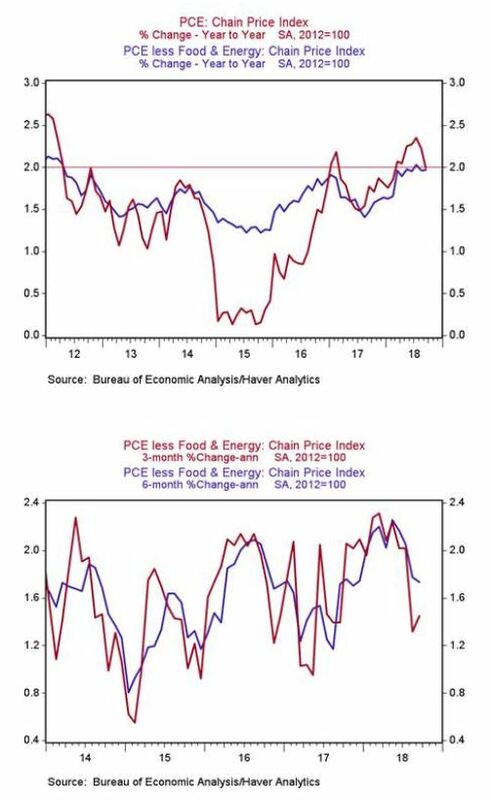 The three- and six-month annualized changes in the core Personal Consumption Expenditure Price Index, which is the Federal Reserve’s preferred measure of inflation, are 1.4 percent and 1.7 percent, respectively, down markedly from this year’s peaks of 2.3 percent. This points to some downside risk to near-term inflation, but we still expect core inflation to climb modestly above 2percent in the coming years, which the Fed has indicated is acceptable as long as inflationary expectations remain well anchored. The risks to near-term inflation are two-sided. 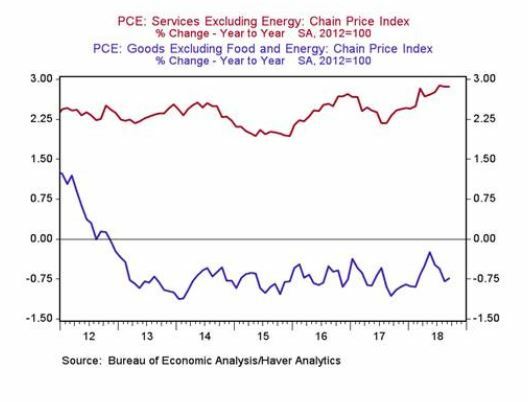 Tariffs, strong domestic economic momentum, and a tighter labor market should push up domestic prices. On the other hand, the stronger U.S. dollar is lowering import price inflation and commodity prices remain well below this year’s highs. Consumer durable goods such as automobiles and household equipment and furnishings, which are likely to reflect the tariff impact, have remained in deflation since 2013, and core services prices have stabilized just under 3 percent. Actual inflation has been at the Federal Reserve’s 2 percent target for several months and we expect inflation to drift modestly above 2 percent in 2019 and 2020. The Fed seems comfortable with allowing inflation to rise above 2 percent in the coming years after several years of below 2 percent inflation, as long as inflationary expectations remain well anchored.